What do you think of when you hear the word “Dancer”? 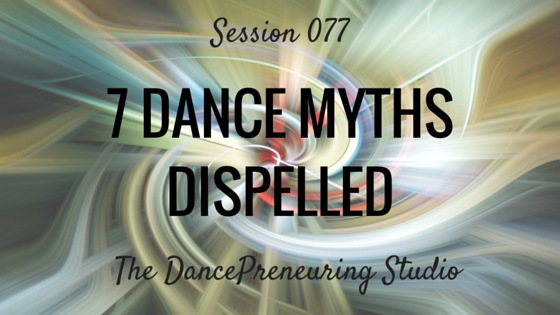 The word can conjure up a variety of images, and in this session of The DancePreneuring Studio, I dispel the 7 most common myths surrounding what it really means to be a dancer. Step to Success: A step to your success is anything that moves your life and your business forward. Whether it’s an app, a book or an idea, you can apply something today that will help you succeed. Today’s step to success is establishing a stop time for your work to prevent burnout. Freestyle Flow: An interesting conversation about what kind of dancer someone thought I was. Hilarious. Dancers are extroverts because they perform in front of people. Dancers take the utmost care of their bodies. Dancers can choreograph, teach and perform. Dancers know their dance history. Dancers need to begin dance training when young in order to be a great dancer. Dancers need a certain body type to dance. All great dancers have full capacity and utilization of all body parts. Would you review The DancePreneuring Studio? I would be extremely appreciative if you would subscribe and leave your feedback on iTunes or Stitcher Radio. It really helps if you do it through the native Apple Podcast App on your smart device. Thanks so much! Annett Bone is the creator and host of The DancePreneuring Studio where she guides her listeners on a journey of transformation inspired by dance, life, and business. The podcast is a reflection of her personal adventure overcoming her fears and returning to her passion for dance after a 20+ year hiatus, the lessons that she has learned along the way, and proving that it’s never too late to be great. Dancing is bigger than the physical body. Think bigger than that. When you extend your arm, it doesn’t stop at the end of your fingers, because you’re dancing bigger than that. You’re dancing spirit.